The company Two Men and a Truck started out as two guys in high school with a truck, providing moving services as a summer job. Over the past 30 years that outfit has expanded into a company with more than 300 locations around the world. But the premise of the business remains the same – they pride themselves on personal service to help you move – including secure, on-site storage options if you need to rent temporary storage space. They offer transportation solutions for both residential and business relocations, too. Two Men and a Truck can handle large moves as well as those that are very small, and can be hired for a long-distance or cross-country move or just to move across town or to another neighborhood. Anyone planning to hire a moving company should be aware that moving companies may be regulated by state authorities in the USA. Meanwhile, any mover transporting cargo across state lines must comply with federal regulations enforced by the Federal Motor Carrier Safety Administration (FMCSA). All consumers should first consult the FMCSA website for tips about planning a move and hiring a moving company. The FMCSA has free consumer information that can help anyone who intends to hire a mover. 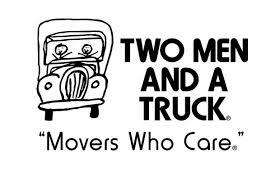 Two Men and a Truck is a legitimate, licensed, insured, and bonded moving company. But you can, and should, verify the licensing status of your particular Two Men and a Truck movers – or any other mover you hire – by using the search engine on the FMCSA website. One of the most unique features of this company is that the movers who pick up your items stay with your belongings throughout the entire process, all the way to your new home. That applies whether you’re moving across the state, out-of-state, or cross-country. Most moving companies don’t do that. Instead the movers who pack up your belongings will take the load a certain distance, but if it is a long-distance move they will eventually transfer the cargo to another truck and another set of movers. A cross-country move, for example, could involve as many as half a dozen different trucks and teams of movers. Having the same team stay with your move from start to finish is a valuable benefit, because you always know who is directly responsible for handling your belongings. Two Men and a Truck will also sell you packing supplies, including everything from boxes and tape to bubble wrap and packing paper. If you want them to delivery your empty moving boxes or supplies to you, they will do that free of charge for orders of $50 or more. Also, if you do not use any of the boxes you buy, Two Men and a Truck will exchange them for a full refund. If you visit the Two Men and a Truck website you can use their handy box calculator to estimate how many boxes you’ll need for your move. That is helpful for planning how to pack, as well as for figuring out how much the move will cost – since transportation companies charge by the volume of cargo. While on the site, you may want to take advantage of their other resources such as a packing and moving checklist and a blog about moving. The company’s tagline is “Movers Who Care” and their brand’s motto is “Treat everyone the way you would want your Grandma to be treated.” Bear in mind, however, that Two Men and a Truck has grown into an international franchise organization. That means adherence to certain common core brand policies and standards – but with some leeway for individual franchise owners regarding how they choose to run their particular local franchise. For that reason is it prudent to evaluate your particular Two Men and Truck business based on localized feedback. Two Men and a Truck does market the fact that is has a 96% referral rate from satisfied customers, though, and that level of customer loyalty speaks well for any company.